Three weeks in, and we have the first new setter of the year. He sounds sporty, so I hoped that that was as far as the football association (grin) [Groan. Ed.] went. A fair-sized grid, 18×11 greeted us, consequently with a fair-sized set of clues (64). Moreover, 54 cells would need shading, bounded by 35 cell edges, and with DCLX to appear in the finished grid, I wondered if this was the mathematical puzzle in disguise. Clue-wise, there were some clashes. Congratulations to those of you who immediately synonymised the title as United States and assumed that there would be an awful lot of them. I suspect that most of us had to wait until INLAND crossed with HAJ to give New Jersey. Once the theme was revealed, the possible two-letter abbreviations certainly helped me with some of the clues. It certainly helped me with EXULS (courtesy of Texas) and MEDIATIZE (from Arizona). All in all, everything came together nicely. My only real gripe was 52ac Rice maybe from old Queen (King absent) (6) for ANNEKA — she hasn’t been on TV for ages. I do so sympathise with overseas solvers and those under about 30. All the way through, I suspected that DC would be the missing item, even though I know that it isn’t a state. Sadly, it was Minnesota that got booted out of the main grid and had to be written in scruchy-up style. I did try and check this grid about a dozen times, and even now wonder if I made a silly mistake. As I put AK into the top left corner of the grid, I wondered what Arkansas was doing so far out of place! Still, if it can be pronounced so oddly, anything was possible. Of course, it was Alaska that went there, but it made me wonder if having the states in approximately their correct positions was an unwritten requirement. What if someone put MN near Texas with NM up by the Great Lakes? Or, less bizarrely, got Alabama swapped with Louisiana? Certainly not me! Finally, we had to replace four letters with DCLX and do a bit, of shading — well, quite a lot actually. The four “framing items” thus became CANADA, MEXICO, ATLANTIC and PACIFIC. 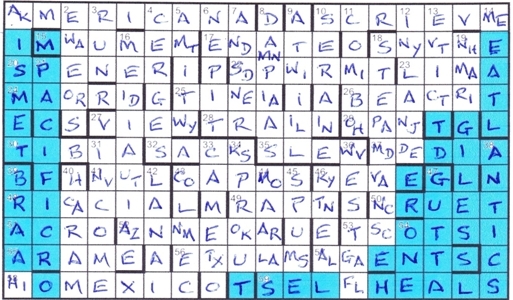 The first letters of clues to across answers beginning with S gave Sea blue. Some nice touches to finish with. An impressive grid, Awinger, and an enjoyable puzzle. This entry was posted on 8 February 2019 at 4:00 pm	and is filed under Solving Blogs. Tagged: Awinger, Joint Conditions. You can follow any responses to this entry through the RSS 2.0 feed. You can leave a response, or trackback from your own site.